Red blood cells (erythrocytes) are present in almost all vertebrates and their main function is the transport of oxygen to the body tissues. Their shape dominantly influences their functionality. In almost all mammals in normal conditions erythrocytes adopt a disk-like (discocyte) shape which optimizes their flow properties in large vessels and capillaries. Experimentally measured values of the relative volume v of stable discocyte shapes range in a relatively broad window. However, this experimental fact is not supported by any existing theoretical membrane-shape model. 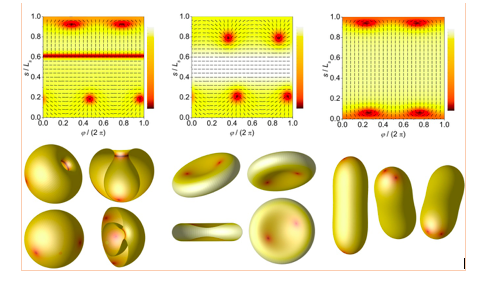 In our study we model the erythrocyte membrane using a hybrid Helfrich-Landau type mesoscopic approach taking into account in-plane membrane ordering. We demonstrate that the extrinsic membrane energy term efficiently broadens the window of v values where discocyte shapes are stable. A fingerprint of the relative importance of the extrinsic curvature energy term are locations of topological defects (TDs) within a curved membrane. Favored positions of TDs can be predicted without solving Euler-Lagrange equations via intrinsic and extrinsic geometric potentials, which we derived using the parallel transport method.